The self-diagnostic function of the SRS unit allows it to locate the causes of system problems and store this information in memory. For easier troubleshooting, this data can be retrieved with the HDS via the data link circuit. вЂў When you turn the ignition switch to ON (II), the SRS indicator should come on. If it goes off after 6 seconds, the system is normal, and is not currently detecting any problems. вЂў If there is a problem, the system locates and defines the problem, stores this information in memory, and turns on the SRS indicator. The data remains in memory even ifthe ignition switch is turned to LOCK (0) or the battery is disconnected. вЂў The data is stored in memory as a diagnostic trouble code (DTC). вЂў DTCs are either latching or resetting depending on the malfunction. With resetting DTCs, the SRS indicator goes off the next time the ignition switch is turned to ON (II) and the system is normal, but the DTC is still stored. With latching DTCs, the SRS indicator does not turn OFF until the malfunction is repaired and the DTC is cleared. вЂў When you connect the HDS to the data link connector (DLC), you can retrieve a more detailed DTC in the HDS "SRS" menu. NOTE: Only read DTCs from the SRS menu, not from SWS menus unless instructed to check SWS DTCs. SWS (ODS unit) DTCs are subcodes of SRS unit DTCs. Only troubleshoot the corresponding SRS DTCs. вЂў After reading and recording the DTC, go to the troubleshooting procedure for that code. вЂў Make sure the battery is fully charged. If the battery is dead or low, electrical measurements values may not be correct. вЂў Use only a digital multimeter to check the system. Make sure its output is 10 mA (0.01 A) or less when switched to the smallest value in the ohmmeter range. A tester with a higher output could damage the airbag circuit or cause accidental airbag deployment and possible injury. 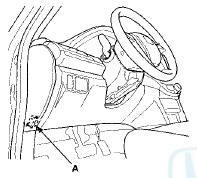 вЂў Whenever the ignition switch is in ON (II), or has been turned to LOCK (0) for less than 3 minutes, be careful not to bump the SRS unit; the airbags could accidentally deploy and cause damage or injuries. вЂў Before removing the dashboard wire harness or SRS floor wire harness, disconnect the driver's airbag connector, the front passenger's airbag connector, both side airbag connectors, both side curtain airbag connectors, and both seat belt tensioner connectors. вЂў Do not touch a tester probe to the terminals in the SRS unit or harness connectors, and do not connect the SRS unit terminals or the sensor terminals with a jumper wire. Use only the backprobe set and the multimeter. Backprobe spring-loaded lock type connectors correctly. NOTE: Make sure the battery is fully charged before you begin. 1. Make sure the ignition switch is in LOCK (0). 2. Connect the HDS to the data link connector (DLC) (A). 3. Turn the ignition switch to ON (II). 4. Make sure the HDS communicates with the vehicle and the SRS unit. If it does not communicate, troubleshoot the DLC circuit (see page 11-181). 5. Use the HDS to check for SRS DTCs. 6. Read and record the DTC. 7 Turn the ignition switch to LOCK (0), then wait for 10 seconds. 8. Disconnect the HDS from the DLC. 9. Do the troubleshooting procedure for the DTC. 1 . Make sure the ignition switch is in LOCK (0). 5. In the SRS MENU of the HDS, select SRS, then DTC to clear DTCs. 6. Turn the ignition switch to LOCK (0), and wait for 10 seconds. If there was a malfunction that sets a DTC, but it does not recur, a DTC will be stored in the memory, and the SRS indicator may come on the malfunction detected. NOTE: вЂў Check the condition of the battery (see page 22-90), and the charging system (see page 4-27). Low battery voltage may cause some intermittent failures. вЂў A faulty cable reel can cause intermittent connections related to the driver's airbag inflator DTCs. After checking the DTC, troubleshoot as follows: 1. Check for DTCs with the HDS (see How to Retrieve DTCs). 2. Clear the DTCs with the HDS (see How to Clear DTCs). 3. Set the parking brake, then start the engine, and let it idle. 4. The SRS indicator comes on for about 6 seconds and then goes off. 5. Shake the related wire harnesses and the connectors, and look for loose connections, poor pinfits, and poor grounds. 6. Take a test-drive (quick acceleration, quick braking, and cornering), turn the steering wheel fully left and right, and hold it there for 5 to 10 seconds. If the problem recurs, the SRS indicator will come on. 7. If you cannot duplicate the concern, ask the customer about the conditions when it occurred, or ask the customer to demonstrate the concern. 8. If you cannot duplicate the intermittent failure, the system is OK at this time.